Chances are that if you live in New York City, you do your fair share of pounding pavement on a daily basis, and that can mean serious foot pain. That pain is a little different for everyone, but much of the time it's on account of a biomechanical problem; in other words, there is an imbalance, maybe a misalignment, when you move your lower body. A problem like that typically means that weight is being unequally distributed on different parts of the lower body. That unequal distribution can lead to pain, injury and difficulty with mobility. That's not to say that any of this pain is permanent. With the right care and maintenance, long-term pain can be avoided and even completely stopped. We all need to keep moving and go about our lives and technology like Gait Analysis makes that possible in many cases. 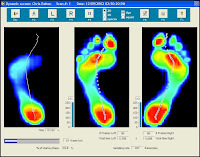 One specific tool I use at Living Well Medical in NYC to diagnose imbalances is the GaitScan, a gait analysis system that measures the pressure distributed throughout the feet. With the GaitScan, I can see when there is too much stress placed on a particular area of the foot. We take that information and fabricate custom orthotics, which are basically corrective inserts for the shoes that are built using the data collected by the GaitScan. What you end up with is a one-of-a-kind shoe insert that can restore normal function and reduce pain by more equally distributing body weight on the foot. Pain like shin splints and plantar fasciitis often find relief from custom orthotics. Proper biomechanics is especially important for those involved in athletics like distance running. If you have foot pain, take a look at an old pair of sneakers and look for uneven wear patterns. It might be an indication of a problem. Living Well Medical helps people with problems like these year round. For foot pain treatment that gets the job done, give us a call at (212) 645-8151. We'll be glad to help you.